Araku valley is the best place, this is a hill station, About 135 kms from Vishakhapatnam (Vizag) and can be reached by a smooth ride from Vizag in approximately 3 hours and is close to the Orissa State border. If you plan to make a trip to Araku, go to Shimliguda railway station which is the highest station on the broad gauge of Indian Railways. The journey to Araku Valley is the most enjoyable as the train passes through tunnels, hill sides and streams. It is a good option to go to Araku by train and return by road. It has been a wonderful place for people who like to enjoy in between the hills, forests, beautiful roads, water falls, cottages in forest and beautiful sceneries. Best place & climate for nature lovers. There are frequent state and private buses that ply between the cities and it takes 5 hours to climb the mountain by train to Araku valley as it goes slow to enjoy tunnels. Try to travel during October to February. Will be foggy and misty will be realistic. 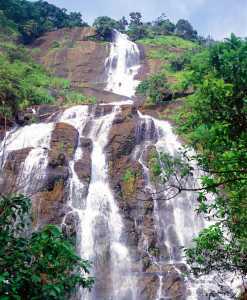 However the town still has several hidden spots that make it worth a visit in the monsoon and winter months. Avoid all the standard tourist options, namely the local dam, on weekends, especially in the monsoons, they will be filled with drunkards, pan-spitting men etc. Recommended are the fall, lakes, sceneries, gardens, tribal people dance, tribal life style, coffee/tea plantation, jack fruit & mango trees and ancient caves, all within a short drive and trek away. Apart from cheesy food and over-priced shopping, Araku is most famous for its 'coffee, south Indian tasty food, and hand crafts and things made by tribal’s’. Strongly recommend that you pick some up, that is if you can decide from the endless choices that are available. This place is also home to around 19 tribes. The women are usually seen with their saris draped unusually, the ends tied over one shoulder, and with large nose ornaments. The serene and soothing atmosphere of Araku Valley makes for a peaceful getaway. Trekking, camping, waterfall rappelling, caving, Mountain train, Adventurous nature camp in wooden cottages between the forest, Shopping, Tribal dance in the evenings etc. The Resort people will help you organize these.